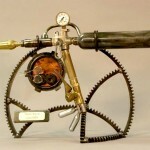 Whilst Maets’ various machines and creations were beautiful in their terrifying efficiency and functionality, often their form left something to be desire. On the days and nights where his creative muses could not be put down by schematics or mock-ups, Maets would wander slowly around the shop and gather things; discarded cogs, superfluous parts and so forth. These he would take to a quiet corner of the shop and proceed to fulfil his inner visions. The image of the cog is not often examined in an artistic sense; it exists with a purpose, it has no visual criteria to fill, it must only turn. However, the toothed wheel is an interesting motif. It can be adapted from the crude circle with attached bricks, to a whirling plate of finery, intricately carved spokes leading to fine, triangular teeth. 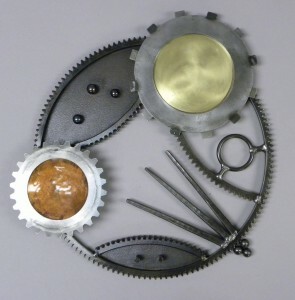 The contrast between such gears was one of the major themes in Maets’ artwork; the idea that beauty could be merged with purpose and functionality, but that the concepts could also exist independently. What he achieved has often been compared with the concurrent movement of Cubism that arrived with Pablo Picasso, albeit more elegant and less establishment challenging. There is speculation that the two met on several occasions, but no solid evidence has been documented. These pieces were apparently never intended to be sold, as they were all found either packed away in the steam shop’s storage hollows, or still hanging upon the walls, dust barely dulling their sheen.